Use a large black garbage bag to collect scraps of paper. When class starts, have one student from each table go to the bag and return with an arm load of the scrap paper. At the end of class, have them return what is left to the bag. I absolutely love Denise M. Logan's Dynamic Art Projects for Children. I refer to it often, and that is where the idea for this lesson originated. However, I really enjoy adding my own twist on the projects. I also enjoy letting my students add theirs. The students drew the cactus in pencil on a sheet of 11x14 white drawing paper. They divided each pad of the cactus into two or three sections. They used construction paper crayons to first color each section a different color, then to draw designs. 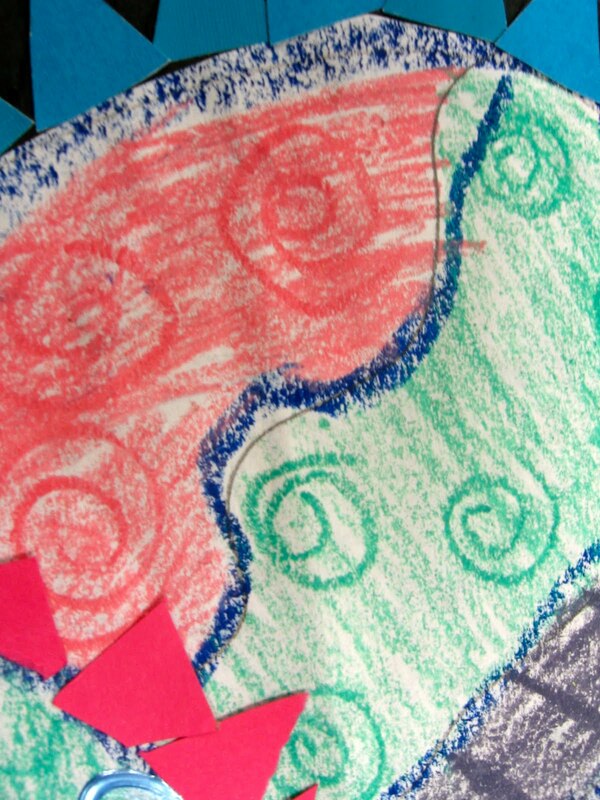 I asked the students to use the same crayon for drawing designs that they used for coloring. I wanted them to see that there is a difference in coloring and drawing with a crayon. I also wanted them to see how different amounts of pressure on the crayon can create different effects. They used Crayola Twistables to trace around the edge of the cactus and each pad. Also, throughout this lesson, students were required to use the correct vocabulary for the parts of a cactus. Drawing and coloring the cactus took about one- 45 minute session. 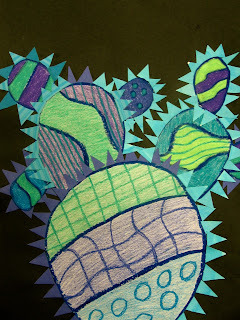 Next, the students cut out the cactus and glued it to a sheet of 11x14 black construction paper. They had to make sure that the bottom of the cactus lined up with the bottom edge of the construction paper. They used a lot of different kinds of paper to make the spines: origami, scrapbook, construction, wrapping paper, painted scraps, etc. They had to cut each spine (a triangle shape) individually to get the desired look. When they tried to cut out a strip of triangles connected at the bottom (looked like monster teeth), they couldn't properly glue it to the rounded pads of the cactus. They did find that it was easiest and quickest to fold the paper and cut several spines at once. Then they would put drops of glue around the pad and place several spines at a time. Instead of cut one spine, add one drop of glue, place spine, cut another, drop of glue, place spine...You get the idea. It took at least two- 45 minute sessions to cut and glue all of the spines. I had to stress to the students that it was okay if their spines stuck off the edge of the paper. I didn't want them to let the size of the paper confine their artwork. The final touch was to use puff paint to draw more designs on the cactus. I also stressed to them that they were using the paint to draw MORE designs, not to trace the designs that were already drawn. This took one-45 minute session. 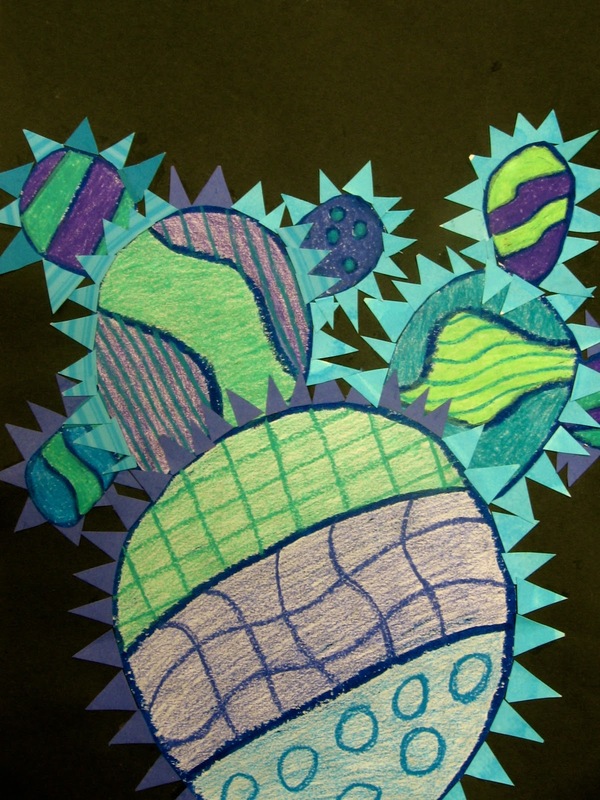 This student chose to use blue as her dominant color and other cool colors to accent. She also chose not to use the puff paint to add more designs to her cactus. I like to let the students have some creative control over their artwork! 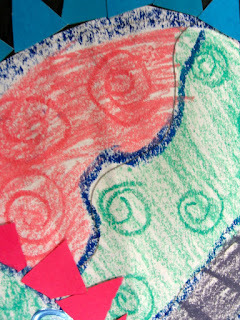 This is a really eye-catching art project for the art classroom! I love the contrast of the brightly colored spines to the black paper. It would also make a great writing prompt for the regular classroom. ARTS INTEGRATION!! !